An exterior view of Johannesberg Castle, the site of peace talks on Yemen, in Rimbo, north of Stockholm, Sweden, Dec. 4, 2018. "We have no problem holding talks with the other side. We will judge whether the Stockholm talks are serious or not tomorrow," a rebel spokesman told an Arabic language television network. These are the first talks between the Iranian-backed Houthi rebels and the Saudi-supported Yemeni government since 2016. They are aimed at moving toward a political settlement of the 4-year-old war. 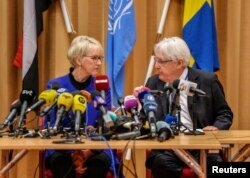 Swedish Foreign Minister Margot Wallstrom and U.N. envoy to Yemen Martin Griffiths attend the opening press conference on U.N.-sponsored peace talks for Yemen at Johannesberg castle, in Rimbo, Sweden, Dec. 6, 2018. "I'm also pleased to announce the signing of an agreement on the exchange of prisoners, detainees, the missing, the forcibly detained, and individuals put under house arrest," Griffiths said. "It will allow thousands of families to be reunited and it is product of very effective, active work from both delegations." Griffiths urged both sides to "work in good faith ... to deliver a message of peace." The rebels control the city. The Saudi-led coalition trying to drive the Houthis out of Yemen say they receive Iranian-made weapons through the port — a charge Iran denies. Saudi-led airstrikes against the rebels are compounding the misery — wiping out entire neighborhoods and destroying hospitals. A Saudi missile strike on a busload of children in August killed 40. The coalition called the attack "a mistake."